Cloth Diaper Covers are a flexible diapering option. Of all the cloth diapering options available to me, cloth diaper covers were the last for me to try and the last on my list of styles that interested me. They don’t call them modern cloth diapers for nothing, so I made up my mind that I was going to use modern cloth diapers, mainly pocket diapers. However, after finally obtaining some fitteds, prefolds and cloth diaper covers I decided to go for it and try them. Here are THREE great reasons I ended up loving cloth diaper covers and why I think you will to! They’re inexpensive and interchangeable. 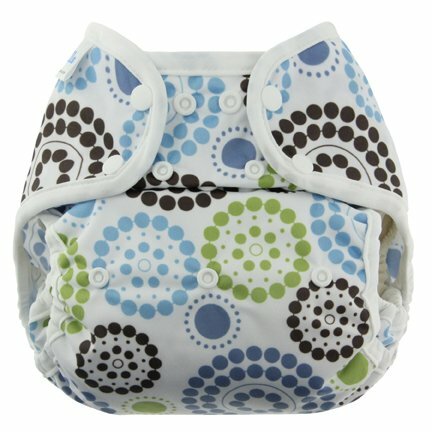 When you use diaper covers you can use them with many different types of cloth diapers. Stay dry inserts, prefolds, fitteds, flats, hybrid bio inserts, etc. They’re very versatile and come in sizes or one size and even in different closure methods. They come from all brands and can often be found with no bells and whistles for as low as $5-7 each. You don’t need one for every diaper change which means you won’t have to invest as much money up front. They don’t need to be changed at every diaper change. Because most cloth diaper covers are solely made of a waterproof material, they can easily be wiped down if needed at a diaper change and then reused. You can use them again and again until you feel their getting a little smelly or until they accidentally get soiled by your little one. They save you money, electricity and work! Cloth diaper covers come out of the washer just a little damp. If you have enough you can hang them to dry and they literally dry in no time. Not having to place them in the dryer keeps them in good shape longer and saves money by not having to waste electricity on them. Need to dry them in a hurry? well 5-10 minutes in your clothes dryer max, is all you’ll need. It’s not necessary to put them through an entire cycle. So how about you? Have you tried cloth diaper covers yet? Were you as surprised as I was at how much I enjoyed using a more traditional method of diapering over the modern diapers?